It’s always big news when Nokia announces a new smartphone, and it’s looking increasingly likely that the Mobile World Congress in Barcelona on February 24th is set to see a new, budget handset join Nokia’s growing smartphone ranks. 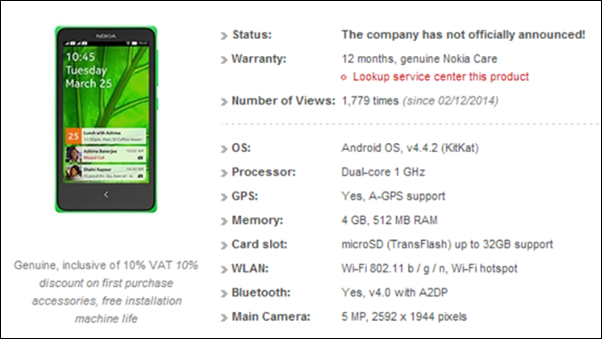 The Nokia X, also known as the Nokia X A110 or our favorite name – the Nokia Normandy – is beginning to crop up here and there, with the latest sighting of the new smartphone coming via a Vietnamese online retailer. First noticed by WMPoweruser, the retailer had the Nokia Normandy available at a price of around $110, which fits in with the existing news that the unannounced handset will be aimed squarely at developing markets rather than those power users that smartphone makers tend to covet. This budget-orientation makes sense given the fact that the Normandy is believed to be based on Google’s Android operating system rather than Nokia’s usual choice Windows Phone. Even though Android is the operating system of choice here though, don’t expect to be able to access the Google Play Store via a Normandy – services will instead be provided by Nokia or Microsoft initiatives such as Skype and HERE maps. Considering the phone’s modest pricing though, that’s not likely to be too much of an issue. At the moment it’s looking increasingly likely that the MWC conference later this month is when Nokia will unveil its new budget handset, and we’re sure more details will become apparent before that time. It’s likely that the Normandy will fly under most people’s radar thanks to its budget nature, but the fact that Nokia is dabbling in Android should not be understated. Could we soon see a Lumia-class handset running Google’s latest and greatest? Time will tell, but we know we’d certainly like to see hardware design like Nokia’s being paired with a nice stock version of Jelly Bean or later. We’re only a few days away from MWC and all the pieces of the puzzle will be complete when we hear what Nokia has in store for us. It’s highly likely that we’ll see a new Lumia or two at the event, along with the elusive Nokia X / Normandy, or whatever you like to call it.